On this day in 1995, we lost Old School WWF Legend Big John Studd at the age of 47 due to liver cancer and Hodgkin’s disease. Big John Studd wrestled for the World Wrestling Federation from 1982 until 1986 and again from 1988 till 1989. His biggest accomplishment was winning the second annual Royal Rumble match in 1989, which was not only the first ever 30-man Royal Rumble match, but also the first one that aired LIVE on pay-per-view. He retired from the sport of professional wrestling later that year, in late 1989. 16 Time WWE World Heavyweight Champion John Cena was originally scheduled to face Lars Sullivan at WrestleMania 35, but Sullivan’s situation resulted in that plan getting nixed. After this, plan was for John Cena vs. Drew McIntyre to take place at WrestleMania 35. WWE even planted seeds for this match by booking McIntyre to “injure” Cena’s ankle and cost him a spot in the Men’s Royal Rumble 2019 match. However, this match isn’t happening either as McIntyre is now set to take on “The Big Dog” Roman Reigns at WrestleMania 35. A few weeks back, Samoa Joe captured the United States Championship on SmackDown and took at shot at Cena in a backstage interview. This began speculation that Joe could be defending the US Title against Cena at WrestleMania 35, but that isn’t the case either as Samoa Joe vs. Rey Mysterio for the United States Championship is going to take place at WrestleMania 35. When Kurt Angle’s announced that he’s going to have his retirement match at WrestleMania 35, speculation began that Cena could be Angle’s final opponent, but that isn’t the case either as Kurt Angle vs. Baron Corbin is going to take place at WrestleMania 35. According to the Wrestling Observer, WWE doesn’t have an opponent planned for Cena at WrestleMania 35 as of this writing, but Cena is expected to appear at the Show of Shows. 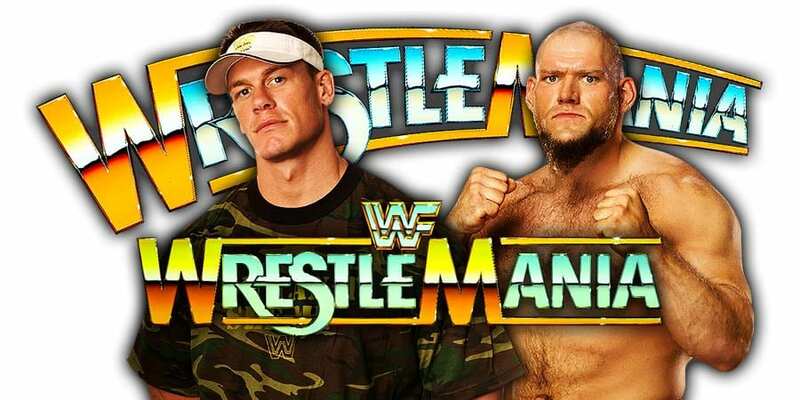 There’s speculation going on that Lars Sullivan (Cena’s original WrestleMania 35 opponent) could be ready to return by WrestleMania 35 and an “Open Challenge” type of match could take place which would see Cena vs. Sullivan happen, but this isn’t confirmed whatsoever. We’ll keep you updated regarding Cena’s WrestleMania 35 plan.